At the corner of every neighborhood in Seoul, especially in the winter when your nose and fingers are so cold, they feel numb…. you will always find a cart on the street that sells this piping hot Korean sweet dessert pancake called Hotteok/Hodduk (호떡). 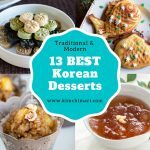 If Korean ice bingsoo is a must have cool-down food in hot summers in Korea, this warm and syrupy hotteok is a must have food for the freezing cold winters. The moment you bite into this pancake, the hot cinammony syrup will ooze into your mouth. Chewy dough with the fried crispness on the outside and the sweet sugar syrup with bits of nuttiness makes it one of my favorite Korean snack/dessert since childhood days. Towards the end of my stay in Korea, I discovered a sweet flour hotteok mix from hansalim (한살림) which was much better for my digestion. There are popular big brands that claim it’s a sweet rice flour hotteok recipe but it actually only has about 3-4% sweet rice flour which is basically nothing. The hansalim hotteok mix that I like has more than 40% sweet rice flour and we actually like the dough better. It comes out more crunchy on the outside. 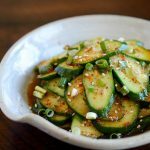 So after several tries, I created this recipe that tastes just as good and also is just as easy on my stomach. Before we get to the recipe, a short history lesson on Hotteok. 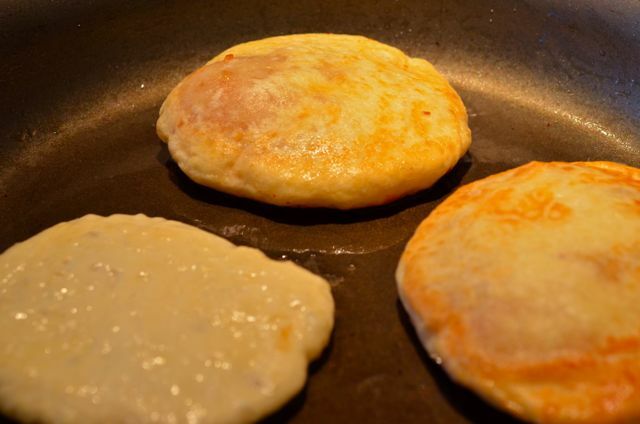 The hotteok pancake has been around since the late 1920’s in Korea, originally made and sold by Chinese refugees who arrived on boats into Incheon. 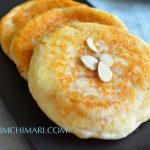 There are similar yeast dough pancakes in Chinese cuisine which are savory using ingredients like chives. But somehow this sweet variation with sugar filling gained the most popularity in Korea and have stuck around for almost 100 years. These days, there are hotteok with with pumpkin and sunflower seeds called ssiatt hotteok/hodduck (seed hotteok) and even some with cheese in them. 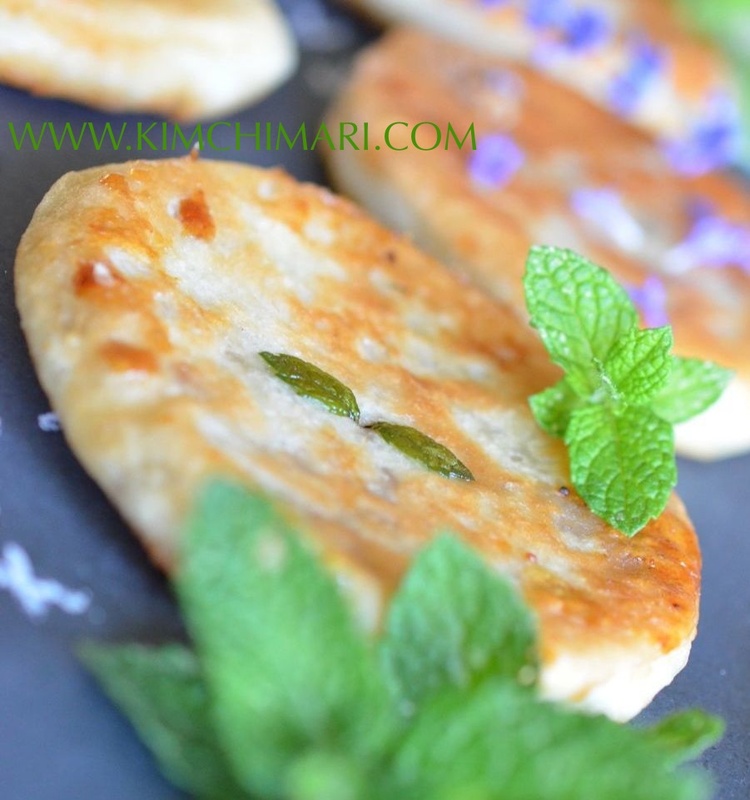 ** Check out my Mint and Basil Hotteok post for my modern take on hotteok with various herbs! It’s so pretty and tasty! Ingredients for Hotteok (with adjustable amounts) are listed in Recipe Card below. Add 1 tsp sugar to 3/4 cup warm/hot water, stir to dissolve. Water should be around 120~130 °F (48~54°C) which is a bit hotter than hot bath temperature. Add 1 tsp dry yeast to sugar water. Let stand for 10 min. (This is to proof yeast). Make sure you keep the yeast water in a warm place so it doesn’t cool down too much. Since it’s instant dry yeast, you can just use it as part of the dry ingredients but I found that it works much better if you mix it with warm water first. Measure and mix flour and salt (1:1 regular and sweet flours). When the little yeast guys have all come alive and are bubbly, mix 1 and 2. Mix yeast sugar water with the flour mix. Dough should be fully wet and sticky. Wetter than pasta dough. Depending on how dry your flour and/or weather is, you may need to add more water. It doesn’t have to be exact so it’s OK if you end up making it too wet. Error on the side of the dough being too wet than dry. Let dough sit for 3 hrs in room temperature or keep in the oven with light turned on if your room is too cold (below 20°C/68°F). Dough should double in size when ready. Prepare sugar stuffing by mixing sugar, cinnamon and chopped walnuts. Chop walnuts finely. If the nuts are too coarse, it can create holes in the hotteok dough as you press it down during cooking. Peanuts are cheaper than walnut so that’s what most street vendors use in Korea. If you like peanuts or any other nuts better, go head and use that. When dough is ready, heat about 3 Tbs or more of oil in a pan over medium heat. Pour about 1 tsp of oil in your hand and rub both your hands so they become nice and slippery. Take about a golf size worth of dough in your hand and spread out with your hands until it’s a little bigger than your palm. Add 1-2 tsp of the sugar mix into the center of the dough and close up the hotteok – making it into a little round parcel. 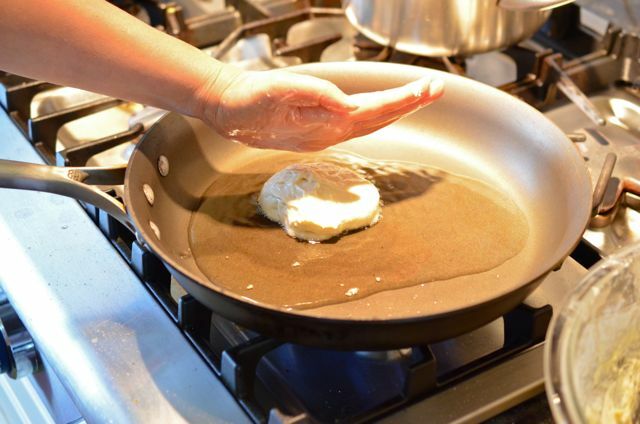 Add hotteok parcel into the pan by flipping the hand to drop the pancake onto the pan, with the smooth side (side that was stuck to your palm) facing upwards. Oil a wide spatula by dunking it in the pan. Press the hotteok and slowly flatten it until the diameter becomes about 4 in/10cm wide. If you press it too much, you will end up with a hole and the sugar content will leak and get messy. It’s OK if that happens, no biggie. Fry the pancake in oil for 3-4 min until edges start to brown. Lower heat if it starts to brown faster than that. You don’t want the heat to be too high because you want sugar to melt inside to become all nice and syrupy. Serve warm with some nice green tea or cold milk for kids! BE CAREFUL when eating hotteok hot because the filling can be really hot and you may even burn yourself so let it cool for couple minutes before you eat it. Leftovers can be kept at room temperature for 1-2 days. Refrigerate to store longer. 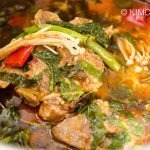 Taste best when reheated in a pan or in microwave. 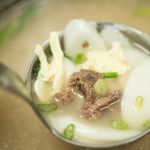 Make a more chewy hotteok by using 2 cups all purpose flour instead. 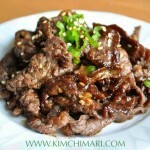 Make a healthier hotteok by using whole wheat flour instead. 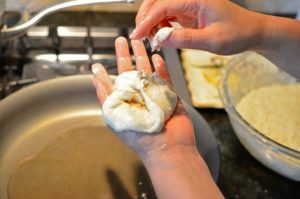 Dough comes out less glutinous so knead it in your hand before making the hotteok to increase the gluten. Make a more modern, fusion hotteok by adding fresh herbs to them. Stay tuned for my next post to see how that’s done! Use different kinds of nuts or seeds for the filling. The moment you bite into this pancake, the hot cinammony syrup will ooze into your mouth. Chewy dough with the fried crispness on the outside and the sweet sugar syrup with bits of nuttiness makes it one of my favorite Korean snack/dessert since childhood days. Add 1 tsp sugar and 1 tsp dry yeast to 3/4 cup warm (120~130 °F (48~54°C)) to hot water. Measure and mix all dry ingredients (flours and salt). When yeast is bubbly, mix 1 and 2. Mix yeast sugar water with the flour mix. Dough should be fully wet and sticky. Let dough sit for 3 hrs in room temperature. Dough should double in size when ready. Prepare stuffing - mix sugar, cinnamon and chopped walnuts. Chop walnuts finely. Pour about 1 tsp of oil in your hand and rub both your hands so they become nice and slippery. Take about a golf size of dough in your hand and spread out with your hands until it’s a little bigger than your palm. 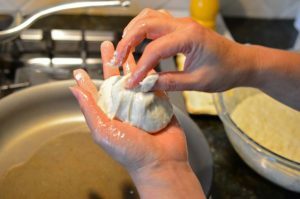 Add 1-2 tsp of the sugar mix into the center of the dough and close up the hotteok – making it into a little round parcel. 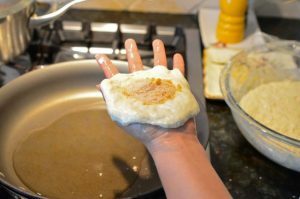 Add hotteok parcel into the pan by flipping the hand to drop the pancake onto the pan, with the smooth side (side that was stuck to your palm) facing upwards. Oil a wide spatula and press hotteok and slowly flatten it until the diameter becomes about 4 in/10cm wide. If you press it too much, you will end up with a hole and the sugar content will leak and get messy. Fry pancake in oil med heat for 3-4 min until edges start to brown. Lower heat if it starts to brown faster than that. You don’t want the heat to be too high because you want sugar to melt inside before the outside gets too dark. BE CAREFUL when eating hotteok - because the filling can be extremely hot and you can easily burn your mouth! So let it cool for couple minutes before you eat it. This takes me right back to the streets of Korea! Those hot chewy cakes were the highlight of my shopping trips Ü Sweet rice flour is on the list! Thanks so much! I tried the recipes, but the dough wouldn’t stick. I followed the instructions to a T, but I cant/don’t use all-purpose flour. I have Coconut Flour and Brown Rice Flour. Should I have changed the recipe? Hi Jeslyn, I am not sure how the recipe would work without using any flour and substituting it with coconut flour or brown rice flour. Because that’s where the stickiness will come from. You can maybe try using some gluten free flour? Good luck and let me know if you have any more questions! I couldn’t find sweet rice flour just normal. Can I use this instead and add sugar? Hi, the difference between sweet rice flour and regular rice flour is not the sweetness but the sticky consistency. Sweet rice flour makes the dough more chewy. If you can’t find sweet rice flour, you can just use all flour. 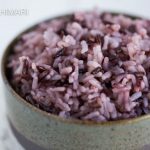 You can try using regular rice flour too – probably OK. Good luck! This was a wonderful recipe for a grandson with 2 safe foods:) Tommy (age 2) has a chronic disease called eosinophilic esophagitis. So far he tolerates rice and bananas. I have been experimenting with rice flours and made these today. I did replace the yeast with rice vinegar and baking soda and they came out very c!ose to my mother’s crepe recipe. The texture was a problem but before long he was dipping them in his rice syrup. Thank you again for sharing your recipe. So happy to hear that your grandson tolerated the hotteok and so grateful to you for leaving me a comment. 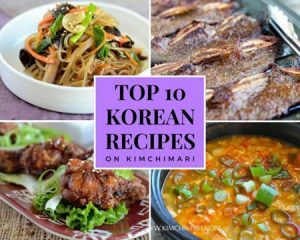 If rice is the only thing he can tolerate, you may also try my http://kimchimari.com/hwajeon/ (can omit flowers) since that has just rice flour, salt and water. And you then dip it in rice syrup or honey. I have also yaksik and tteok ppang but not sure if that has too many other ingredients. Yaksik, you can omit everything but just flavor it with soy sauce and sugar. Tteok ppang does have egg and butter in it so not sure. I made it several times! Great recipe and love the serving size for recipe. It was delicious. Crispy on outside and duk like inside. I only use brown sugar. Thanks for posting! Love ur recipes! My dough is too sticky any remedy? Hotteok dough is quite sticky that is why u coat ur hand with oil before handling it. It is much stickier than regular dough. But add more flour or rice flour if i think it is just too sticky..
Hi! The main difference between rice flour and sweet rice flour is the chewy texture. Sweet rice flour will make the hotteok a little chewier and crispier on the outside. I don’t think it would ruin it but it will not have the same chewy texture. The other recipe versions use just flour only with no rice flour so I don’t think it should be bad, just different texture. I would actually love to hear how it turned out using rice flour so if you do, please let me know! Good luck! I decided to make them but the yeast hasnt bubbled after 10 mins. Did i do something wrong? Depending on the yeast ( how old, is it instant? etc) it may not bubble as much. Did you use warm water? As long as the yeast has not expired it should work. What does the yeast package direction say? Hmm. OK. I used red star brand too. You stirred it and added sugar? I think also for me, there was one time when the yeast did not bubble as much but worked fine in the dough. I think it should work OK for you. The dry yeast they make these days is quite stable as long as it hasn’t expired. If you want to be just really sure, try starting a new yeast mix again with a new packet. Make sure you have right temp water, mix with sugar and keep it warm if your room temp is cold. But I am pretty sure you can use the current mix. People mix the dry yeast even without testing these days so…also once you make the mix, try leaving it in the oven with just the oven light on. It should help it rise much better. Good luck and let me know!! Warm water when you run over finger shouldn’t feel warm or cold..really should not feel warm. If its too warm it kills yeast. Try LUKEWARM water with stirred in yeast..then sprinkle sugar over it and leave it for 10 min…IF NOTHING happens your yeast is dead or too old.. if you eve. See slightly rightness it should work but probably not rise as much as if it is super fresh. I use dry active yeast and not instant and it can sometimes take 20 mins to proof. And it happens all the sudden. Always keep your unopened yeast and opened container of yeast in the refrigerator! It keeps it fresh much longer. I can’t wait to read how you rice mixture works! Good luck! 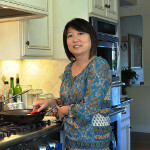 I am new on your site and wanted to say how much I am enjoying your blogs. I am marinating ribs for your Apple Soy Ribs recipe. Can’t wait to see how they come out! 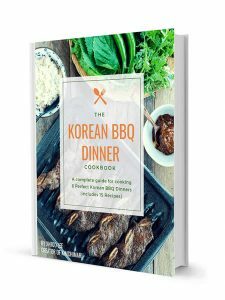 I started cooking Korean food about 6 yrs ago as well as Vietnamese – really enjoy the fusions of Vietnamese and Korean I have been working with…I have to say the only recipe I don’t feel totally at ease with and haven’t made yet are the sweet red bean ” ricecakes” as my Korean friend used to call it..ITS ONE OF ME AND MY SONS FAVORITES! I bought the dryer beans at the Asian market as well as the sweet rice flour but WOULD LOVE TO SEE PICTURES AND your recipe for making them…I like the large fresh ones when I find them of just white rice flour outside dough and sweet red bean paste filling inside but also would like a recipe for the Tarro flavor filling/paste on the inside so I can make it for my son ( its his favorite)..please let me know if you would consider posting recipes and pictures showing important steps of the rice flour texture etc throughout the recipe. 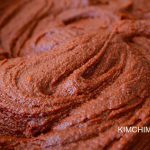 I would be thrilled to make the red bean filling from dry beans to any other sweet filling that is traditional in the same dough recipe and make a big batch!I Thanks again for sharing your recipes and keep up the great job! Hi! Oh yay!! So glad you found my blog! So..hmm…I’m not totally sure which rice cake you are talking about. White rice flour outside with red bean paste filling…is it round and soft and mushy? Are you talking about Mochi Tteok? Or are you talking about Songpyeon(https://en.wikipedia.org/wiki/Songpyeon) – a bit harder, usually shaped like an oval? 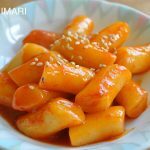 Or Baram Tteok (https://www.pinterest.com/pin/203436108137833395/)? If you let me know which one, sure, I can probably do a post. Thanks for the interest and compliments! anneonghaseyo! read your recipe.. it looks so yummy! But I have a bit of a problem. I am on a TOTALLY gluten free diet. So, i was wondering if it is possible to make these yummies using only rice flour, or gluten free combination flour?